Security Council President Masood Khan briefs media on Mali. The United Nations Security Council has expressed grave concern over the reported military movements and attacks by terrorist and extremist groups in northern Mali, in particular their capture of the city of Konna. “This serious deterioration of the situation threatens even more the stability and integrity of Mali and constitutes a direct threat to international peace and security,” the members of the Council added in a press statement issued on Thursday night, after a briefing on the situation from the UN Under-Secretary-General for Political Affairs, Jeffrey Feltman. According to media reports, on Thursday, Islamist rebels seized control of Konna – a city of 50,000 people some 700 kilometres north-east of the capital, Bamako. Northern Mali has been occupied by radical Islamists after fighting broke out in January 2012 between Government forces and Tuareg rebels – just one of several security, political and humanitarian problems the West African nation has been dealing with since last year. The renewed clashes in the north, as well as the proliferation of armed groups in the region, drought and political instability in the wake of a military coup d'état in March have uprooted hundreds of thousands of civilians. 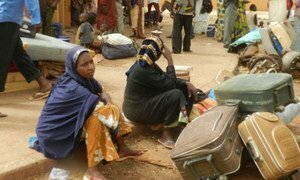 Over 412,000 people have been forced to flee the country's north, and an estimated five million people have been affected by the conflict. The Malian Government and rebel groups are expected to meet for peace talks in Burkina Faso's capital, Ouagadougou, on 21 January. In their press statement, the Council members recalled their resolutions 2056, 2071 and 2085 – which dealt with the situation in Mali and were adopted under Chapter VII of the UN Charter – as well as the “urgent” need to counter the increasing terrorist threat in Mali. Chapter VII of the UN Charter allows the Council to use force in the face of a threat to peace or aggression. One of key elements of the 15-member body's response to the situation in Mali, contained in its resolutions, has been the creation of an international military force to help restore the unity of the West African nation. With resolution 2085, adopted in December last year, the Council authorized the deployment of that international military force – the African-led International Support Mission in Mali, to be known as AFISMA – for an initial period of one year. “The members of the Security Council reiterate their call to Member States to assist the settlement of the crisis in Mali and, in particular, to provide assistance to the Malian Defence and Security Forces in order to reduce the threat posed by terrorist organizations and associated groups,” the Council members said. Echoing comments made by a spokesperson for Secretary-General Ban Ki-moon on Thursday, the Council members also called for the immediate issuance of an agreed political roadmap, “which includes serious negotiations with non-extremist Malians in the north and presses for the full restoration of democratic governance. The Secretary-General's Special Representative for West Africa, Said Djinnit, is continuing his efforts to support the political talks in Mali, including on the establishment of an inclusive national dialogue and the development of a roadmap for transition. In addition, it will be responsible for, amongst other tasks, supporting the Malian authorities in their primary responsibility to protect the population and to create a secure environment for the civilian-led delivery of humanitarian assistance and the voluntary return of internally displaced persons and refugees. The United Nations is concerned about the reported military movements of rebel groups along the frontline in northern Mali, as well as related tensions, a spokesperson for the world body said today.